Local attractions range from Pula's Roman ampitheatre to the Brijuni Island National Park 15km away. Prices do not include local tourist tax 1,40 € per person per day and registration fee 1,35 € per person only first day. Price are valid just for members of Hostelling International. with 1,35 Eur additional first 6 nights (collecting welcome stamps). Payment at the reception only in local currency (Kuna ) cash or by card (visa, mastercard,maestro). Amazing experience . Staff was incredibly friendly. Beautiful place . Beach right out of front door. 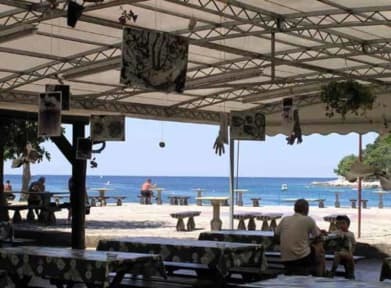 Beautiful beachfront hostel, excellent value for money! Lovely staff too loved my stay here! This place is amazing, it has its own private beach and a huge outdoor area. It also has a bar and a restaurant which is a useful because it’s quite far out of pula centre. You can get the local bus no problem. There are a few shops within walking distance aswell. There are no lockers but there is a safe box in reception that is free to use. The beds were comfy and the bathrooms were okay, not that many for lots of people. The staff were lovely and helpful. Would definitely stay here again! La cosa migliore è che i bungalow sono situati sul mare. L’ostello infatti è proprio sul mare ed e fantastico. Le camere sono un po’ piccole ma va bene per un piccolo soggiorno e per chi non ha troppe pretese. Le signore della reception molto disponibili. I stayed for a relaxing two days. A little bit out of town, but there's a convenient bus service in, and (for me) worth it for the beach side location. No lockers in the rooms, but it felt perfectly safe. Not much food available on site, but the free breakfast was good. Staff were very friendly and helpful. Room was clean, bathroom could have been a bit cleaner though. The location of this hostel and the staff that work there are fantastic. Really helpful ladies in reception in particular! The location is lovely, right next to the beach and bus links to town are good. Rooms and bathrooms are in need of a few updates in particular (locks on doors were broken). Air conditioning in the rooms would have been great - very hot and clammy at night! Ok place to stay if you just want a day or two by the beach. Check in was slow and staff spoke little English. No lockers. Other than that it was fine. Short bus trip into town. A very disapointing experience. The location, near the beach, is excellent. But that is unfortunately, the only positive thing about this hostel. The staff was particularly unfriendly and even rude sometimes. The room itself is ok. But sanitaries are really not appropriate. 1 shower and 2 toilets for 4 rooms of 6 people each is not enough. Especially since these aren't cleaned regularly. Breakfast was not good neither (no coffee etc..). This hostel is defenetly not a good value for money. WORST hostel I have ever stayed at. Not only had a horrible experience with staff (specifically), location, disgusting smell and food, but was told by every local that this is the worst hostel in Pula. Very much agree.